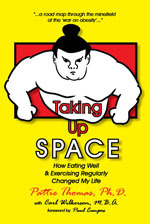 Taking Up Space: How Eating Well & Exercising Regularly Changed My Life by Pattie Thomas, Ph.D. with Carl Wilkerson, M.B.A.
A reluctant warrior in a war she did not particularly want to fight, Pattie Thomas may, in fact, be one of its most powerful spokespersons. In what is best described as a private diary, she shares her journey of reexamining everything she, and every woman, has been told about being fat, and about health and beauty. The raw honesty and emotions in Taking Up Space are uncomfortable, even painful, to read at times. We can't help but feel her same anger, disillusionment and anguish while trying to come to terms with being imperfect and different in a culture that glorifies impossibly narrow standards of beauty and health, especially for women. But it's a story that has never been more critical for us to read. Our culture has this feeling that only after fat people have "fixed" themselves and conformed to thinness does what they say matter, let alone have credibility. A fat woman's story might be accepted when she confesses to her sins and embodies the guilt and flaws everyone believes she must harbor to explain her fatness. Only a few fat women have dared to speak unapologetically about their lives. Yet sadly, even among many of them, there's a feeling that to justify the space they occupy in this world they must be perfect in every way: in perfect health, with prestigious high-paying careers and living in perfectly coiffured homes. But that's not real, and doesn't describe nearly anyone. Our genetic makeup gives us equally diverse ranges of health, physical characteristics, aptitudes, and sizes. Pattie answers the need for a powerful voice of truth in a world that disenfranchises those who don't measure up—not just by being fat, but also by being a poor, working-class woman with a disability. The central fact of much of her life was her fat body, but she never wanted it to be a central fact. "It should have been peripheral," she writes. "How many people could write a complete book about the implications of having brown eyes?" But she couldn't help but take the war on fat people personally. Living in out society as a fat person means enduring a pervasive and constant torrent of harassment and threats, ridicule, ostracism, oppression and discrimination, and the stress of that hurts. It harms health, too, as do the dangerous and ineffective weight loss diets and "treatments" that have been imposed on fat people for decades. "There is much about which fat people should be angry," she writes. And mad enough to fight back and take back the power to decide what is best for themselves, ourselves. It's not just a fight for fat people, but for those of all sizes, because the starving of an entire population in the name of health threatens everyone. "What is at stake is nothing less than the freedom for all of us to be what our bodies are meant to be. We are fighting for our beings, our lives." The private has become public. The government, medical professionals, public health officials, insurance companies, pharmaceutical industry, employers, managed care providers, media and researchers have made our weights a social problem and are making money off what should be a private matter, she says. They want fat people to either become victims by trying to lose weight and act in need of being saved from themselves—ourselves—or they'll accuse fat people of being villains and dragging down society. But, Pattie Thomas writes, "I believe telling people what to do with their bodies is the ultimate in limitation of the freedom of individuals." And when we blindly accept authoritative statements, rather than look to good science ourselves, we give them the power to oppress us. But the government, medical professionals, public health officials, insurance companies, pharmaceutical industry, employers, managed care providers, media and researchers are not our real enemy in this war. Our real enemy is the belief that fat is bad, Pattie says. She came to realize that to win the war being waged against fat people we can stop fighting it. She shows us how to live unapologetically (whatever our size), care for the body nature gave us, and be comfortable within our own skins. Coming to appreciate our differences and the beauty of fat, she writes, is to say that I get to to decide what I value, what I enjoy and what I want. "A fat woman happy with her body is a dangerous thing in this culture." In fact, any woman happy with her body is a liberated woman...free to take up space. weight or who works with clients who face these issues will find this book challenging, disturbing, and ultimately comforting as it attempts to change deeply held prejudices that for most of us are unconscious." "Taking Up Space is among the best books I've read on the costs of stigma for fat people and society. Written for the "average reader," it is sophisticated, funny and touching. Dr. Pattie Thomas, with her husband and co-author, Carl Wilkerson, have clearly demonstrated what we at Size Matters, Too have been telling our clients and radio audiences for years—size prejudice is costing our country a bundle in wasted human resources, and accommodating size diversity is good business, as well as the right thing to do. "I will be recommending this book to my clients and my listeners. It is a must-read for all people of size and people of all sizes!" successfully treat my clients, it is clear to me that Dr. Thomas has captured the essence of what true change and true happiness are all about. A must-read for people of ALL sizes. I will be recommending this to all my clients." "Thomas's incisive blend of sociological inquiry and personal narrative amounts to a provocative treatise on fat oppression in our culture. Taking Up Space is a kind of roadmap through the minefield of the "war on obesity," and it offers protection to the reader ready to fight for cultural change surrounding the meaning of fatness." self-acceptance. I have been uplifted, righteously angered, and supported in my own efforts as a fat human being and activist by each of them. I expected more of the same from Dr. Thomas' book and would have been content if that had been the case. I also expected that it would take me, at most, a weekend to get through the whole thing. I was wrong. "Taking Up Space is an intelligent, holistic treatment on the topic of fat acceptance. Dr. Thomas has presented her self-portrait in a manner similar to that of some of my favorite authors. But she has also provided the social/political/economic context for her inner and outer transformation and has thus presented us with a rich and colorful landscape in which her journey is only one small part. Further, she points out to each of us own our potential space in the masterpiece and invites us to use our own palettes to recreate the world into a thing of beauty, recognizing that we are already beautiful and need only to own that knowledge. Taking Up Space does exactly that—takes up space in the mind and heart of the reader, soothing and reassuring even as it confronts and challenges. Dr. Thomas' optimism renews my faith that the work of one person does matter, and that to save one life (especially one's own) is to save the whole world." "Taking Up Space could be called a memoir with a Ph.D., or it could be called sociology with a heart. Pattie Thomas brings to the table her careful study and analysis of the medical, political, and social aspects of weight in our culture. To this she adds her witty and deeply felt poetry, as well as her revealing and personal journal (and journey) on the path to self-love. That path, she shows, requires that fat people recognize the bigotry that is aimed at them. "Written in a lucid and readable style, this book provides insights and resources for professionals as well as for those who struggle with issues of weight and body image. Taking Up Space should be required reading for all those who want to help make this world a better place." "Taking Up Space is the poignant saga of how one woman has come to grips with being large in a society in which "thin" is worshipped as the ideal. Dr. Pattie Thomas, with her brilliant writing style, shares the pain of her battles. Not just the emotional and psychological pain of being large in a small world, but the actual physical pain of two chronic diseases with which she has to contend. "In Taking Up Space, Dr. Thomas often refers to herself as the reluctant warrior. But as she shares her battle with personal weight issues, as she bravely takes on the societal and medical stigmas that daily drain people of size, she truly becomes a brave sumo warrior who leads the way into battle against the poison darts that are constantly hurled at us. "Dr. Thomas is such a good example of what our society does to a person. She obviously has a brilliant mind. She is a deep thinker, a very good writer, a warm, caring person. But all that our brainwashed world can see is the package that holds her wonderful mind and heart. "My heart cries for all the time that she, and others like her—you, me, thousands—have lost obsessing over weight when we should have been using that time to make this world a better place." "The personal is political, and the political is personal—Dr. Thomas offers her perspective as a thoughtful sociologist to examine the experience of being a fat woman here and now. "A consciousness-raising group is packed between the covers of this book. You will not think the same way about your own experiences after reading it. Artful response to stigma!" "This book has punch—from its personal fat narrative to the social context that stigmatizes a proper identity. "I was struck with how powerful the story became as the myths, poetry, and sage advice conveyed both the dignity and pain of a condition that is increasingly medicalized as obesity. Taken away from its place as a way of life and alternative drama of experience, fat gains embodies and personal dignity, while also claiming a space in the social world for one human variation among many. "This is a story about acceptance, of the fat self and its body, one in need of repeated telling to others and to a public that are largely silent on acceptability." Questions & Answers on Size Diversity by Miriam Berg, President of the Council on Size & Weight Discrimination (PDF).